Discounting Your Price, Value, or Both? It's the end of a quarter and your sales team is looking to meet quotas. Or maybe you've been talking to a highfalutin enterprise-level customer for a long time and want to provide an incentive to close a large ACV contract. Now you want to offer a discount. A discount seems like the key to enticing customers and finalizing deals. Retail companies try to leverage the psychology of discounts all the time in a race to the bottom. Loss leaders in retail industries can come out on top. So why is SaaS discounting such a bad decision? Your customers and your company both think that discounts can help them get what they want. But when you freely offer discounts you don't help anyone reach their goals—and you could erode your product's value in the process. Customers want a product that is right for them. Price is a major factor in determining the right match between product and customer. Price is the exchange rate on the value that you've created—so if you price according to value, both your customer and your company know that each party is getting exactly what they ask for. Discounts are enticing because they appear to offer the value that the customer is seeking for a price lower than your value metric indicates. We judge monetary value relatively, so your published prices are the primary context for your customers' understanding of your product's value. The thrill of a discount relies on the price anchoring effect, or our tendency to rely on the first number we see to influence our decision about a subsequent price. Discounts use the original price as the anchor so that the second price offered has a point of comparison. Customers who might have originally considered $899 expensive for a premium plan of this particular software will now understand that it's actually a “deal” because it's placed within the context of the $999 original price. The original pricing plan aligns the value of this particular package with a $999 price. The company then offers the package value it has just defined for a lower price. Thus discounts rely on an established pricing system to create context, and then intentionally skew the alignment of price and value. Though at first discounts might look great to the customer, messing with price/value alignment has consequences. When you preach a “pay-for-exactly-what-you-get” mentality and then lower the price, you're either promising your customers less value or you're lowering the value of your product in their eyes. 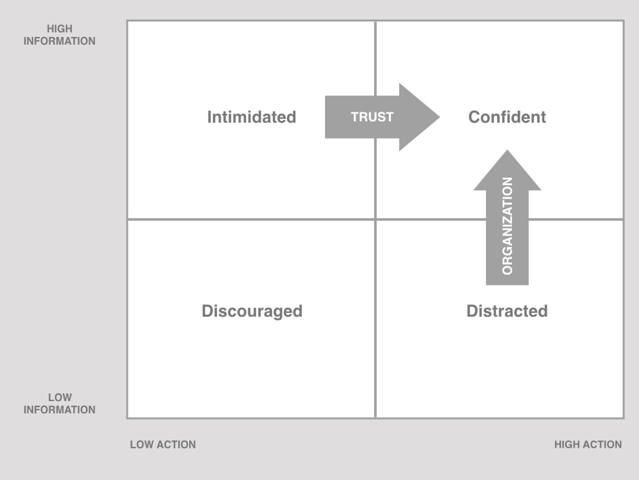 Your potential customer's perceived value of your product shapes his or her willingness to pay. 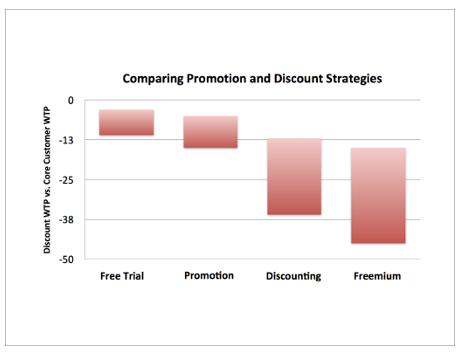 Constant discounts erode this perceived value and needlessly lower willingness to pay even more than free trials or other promotional offers. Our price sensitivity campaigns showed that discounts lower the customer's perceived value of the product, and by extension the willingness to pay, by 12% or more. Double-blind studies have also shown that customers think discounted products don't perform as well as their full-priced counterparts. This might mean that SaaS customers question the functionality and reliability of your software simply because you were willing to accept a lower payment for the product. Meanwhile customers who are seeking more value—those who are looking for the solution your product provides—are probably willing to pay full price for it. Every SaaS company wants more customers. A discount offer on your pricing page can reduce conversion friction and encourage more potential customers to buy. But if you're relying on discounts to push people through your pricing page, you need to fix your page. The communication between value and price can be lost on the pricing page if the page is difficult to understand and doesn't encourage action. Potential customers that are not inspired by your pricing page will spend more time in the sales cycle because they won't feel confident in their purchasing decisions. They should not need discounts to feel this confidence—they should understand the value they're getting based on how you've laid out your pricing, positioning, and packaging. Companies that use sales teams will find that the desire to close more deals drives the discount offer. Jason Lemkin, SaaS founder and VC, points out that “time is the enemy of deals.” Discounts shorten the sales cycle, and shorter cycles mean reps can complete more deals in the same amount of time. But while the brute force of a discount might be effective in simply closing a deal quickly, reliance on this strategy means that your main selling point is a low price. If you routinely rely on discounts to close deals, there might be a fundamental misalignment of your original price and value. That's why it's essential to make sure your product fills the needs of your market. Entrepreneur and angel investor Sean Ellis says that you need to make sure your product is a must-have for your market. To determine if you have created a product that your market wants to pay for, survey your customers and ask how they would feel if they could no longer use your product. Ellis says a good indication of product-market fit is finding that over 40% of them would be “very disappointed.” If your survey results show less than 40% feel this way, communicate with customers about what else they might look for in your product so you can better align the value of your packaging with prices that lead to profitability. Shortening your sales cycle is essential to meeting revenue goals and improving the overall machine of your business. But using a discount as a crutch to meet these goals speaks to existing problems in price-value alignment that will only compound if not addressed. Closing an enterprise-level deal for $220,000/year might seem like a huge win. But if that deal is really valued at $300,000, you lost $80,000 to close the deal. If this customer stays with you for 3 years and you grandfather them at this discounted price, you lose $240,000 over the course of this customer's lifetime—that's a loss greater than the customer's ACV. Discounting might not only mean ARR loss for your company. It might cause you to lose customers, too. Price-sensitive customers who convert because of a discount might never have been your ideal customers in the first place. If they don't have a real need for your product—a need that overshadows the offer of a discount—they're likely to churn early. That means you'll have wasted costs acquiring these non-ideal customers who have poor LTVs. 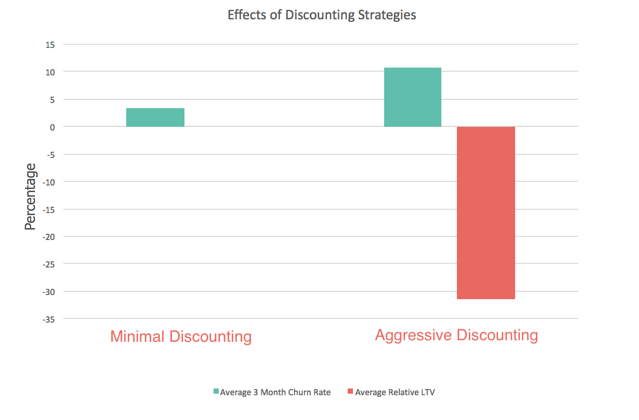 We studied discounting across 88 different companies and found that companies that engaged in aggressive discounting had customers with 32.41% lower LTVs on average than the customers of companies offering lesser discounts. Companies that aggressively discounted also saw 10.82% churn in three months, as compared to the 3.44% average 3-month churn for companies offering lesser discounts. Lowered LTVs with the same CAC means that your LTV:CAC ratio will be low. And even if these discount customers don't churn early, the payback period for them to recover their CAC will be longer than usual. Discounts also force you into unrealistic strategies. 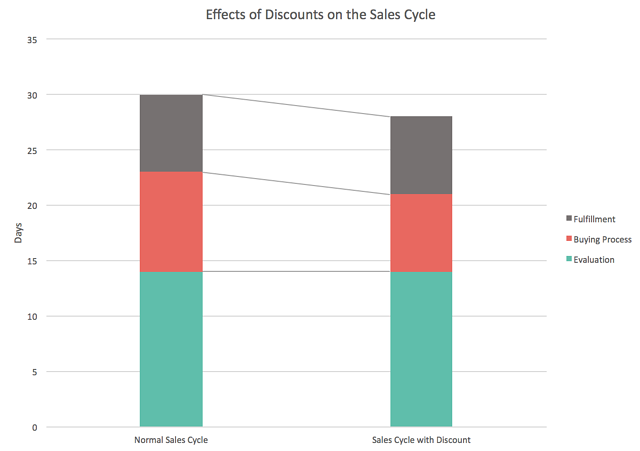 A study by sales analytics company InsightSquared examines the effects of a 20% discount on a SaaS product. They show that with a base MRR of $10,000, it would take nearly twice as many customers to reach $15,000 ARPU through upgrades compared to a full-price plan. Planning to acquire and retain this many extra users is not sustainable. These unintended results can wreck havoc on your unit economics. If they spiral unchecked, the revenue loss through discounts can hinder your ability to properly service your customers. Customers who are motivated to convert solely because of a discount probably don't understand the true value in your product. This undermines any work you've done to create a value-based pricing model. When you skew the alignment between price and value, you make it acceptable for customers to value your product less. This can damage your brand and your reputation. And though discounts can shorten the sales cycle and potentially close deals, the long-term economics of acquired customers through discounts are dangerous. Create a free or low-priced entry-level tier: The beauty of pricing tiers is that you can target many different sections of the market, so use this to your advantage. By offering a part of your product's core value that scales with a lower price, you to cater to more price-sensitive customers without undervaluing your product. Encourage annual subscription plans: The economics of annual subscription plans show that you can offer an annual plan for a lower price than the sum of 12 monthly rates and still benefit hugely from the contract. Even if only 10% of your customers switch to annual plans, you'll increase your cash flow and become profitable immediately. Annual plans also improve your retention rates. The economics of discounts aren't black and white. But amidst the complicated psychology around pricing and discounting, the threat of eroding your product's value looms large. This product value is the bedrock of your business. Don't rely on discounts that skew the alignment between your product's value and your price and chip away at this foundation. Your customer could end up with a product that doesn't meet their needs, and your company could end up with a customer that isn't in your target market and won't scale with the business. Look to build and communicate value and hold the line on your carefully crafted pricing strategy. You can outsmart a discount.